Top Folders Pro is an excellent scanner app that offers a wide variety of features. The app is actually on sale, it is free and only for a limited period of time. It’s regular price is $4,99. 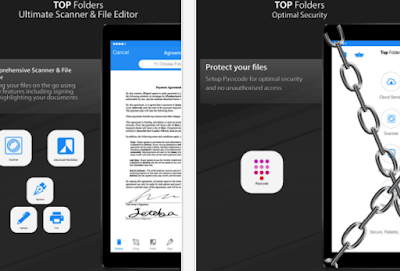 Top Folders Pro enables you to create high quality PDF scans of your documents using the camera of your phone. Once scanned you can use the app’s editing features to sign, highlight, annotate, delete and crop pages. It also lets you passcode your documents and support touch ID security measures so it’s only you who can access and view your materials.